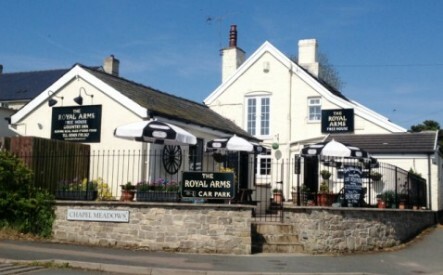 The Royal Arms is a traditional country pub dating back to the 17th Century. Taken over by Claire and Peter Nottage in September 2016, the pub has a warm and charming atmosphere with comfortable and traditional furnishings and a real log fire for chilly evenings. 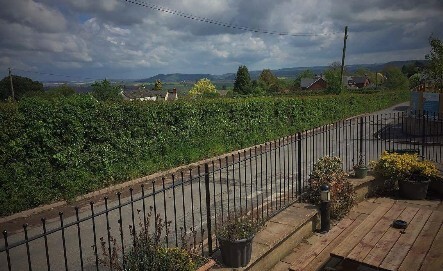 Outside is a paved area with picnic benches where visitors can enjoy the spectacular view across the valley, listen to the sheep on the other side of the beautiful hedgerow and watch the occasional tractor pass by. In the summer the patio is full of flowers and is a lovely place to be. 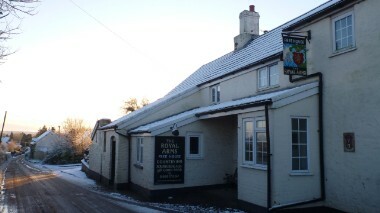 The pub is the hub of village life and our locals are charming and friendly welcoming those visiting the area. 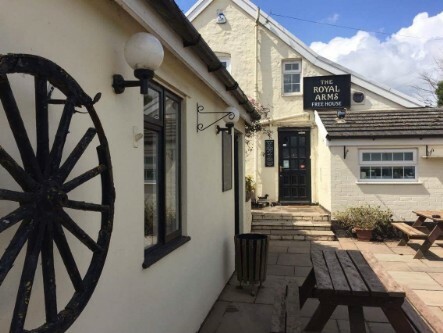 We provide a selection of real ales, local cider and variety of wines and spirits as well as home-cooked food purchased locally wherever possible. Within the pub there are two bars: one which extends to a seated dining area and the second with a pool table and darts board. We also have a selection of board games for the kids. We serve home-cooked good quality food and roast dinners only on a Sunday (see below). Take away orders can be telephoned through for pick-up or we can serve you a drink if you come in to order your food and wait. We have fortnightly Quiz Nights, Sky Sports, Book Group, a Pool Team & monthly events. We have experience in catering for events such as birthdays, christenings, wakes, Hen & Stag dos & other occasions, with options to suit your needs and budget. We can open outside of the times below for events such as group breakfasts & Grooms needing a swift half ahead of the ceremony! Please just call, email or pop in to discuss your event with us. Dogs are welcome if well behaved and kept on a lead. Sunday roasts orders must be made by 2pm on Saturday by contacting us on 01989 770267 or via Facebook Messenger. Due to the size of our kitchen we only serve roasts on a Sunday. Please note that food is not served on a Sunday or Monday evening.